If you travel a lot, like we do, you are forever getting ideas of places you want to go. Where do you keep that list? I’ve tried just keeping lists on paper, Evernote app, or a shared message space between my husband and myself. Any method you have for remembering these great ideas is better than nothing, but wouldn’t it be nice if the items were actually on a map? So, if you find yourself in the vicinity of one of the places, it will jump out at you when you look at your map. We are traveling to Italy and Croatia this summer and friends recommended a national park in Croatia named Plitvice. Don’t ask me to pronounce it! But, the excited look in their eyes when they told us about it meant it is a place we definitely want to visit if we are anywhere nearby. Will we be anywhere nearby? I have no idea, but when I look at a map, I want to be reminded where it is, then I’ll know if it is possible for us to go there. You now see the icons for each saved list, Want to go is the second one. Tap the 3-dot menu to the right of the list and “Show on Map.” If it reads “Hide on Map” that means it is already showing. Notice in the top image that I have several lists. 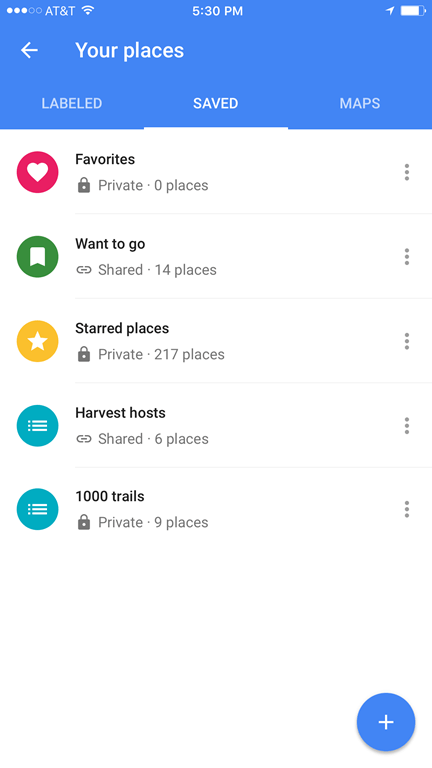 The bottom two: Harvest Hosts, and 1000 Trails are lists that I created. These are RVing places we belong to. Harvest Hosts is unique overnight stops at wineries, farms and attractions. Thousand Trails are large campgrounds in beautiful places . Every time I research them, I will add them to the list. Then whenever I’m using Google Maps and I’m logged in to my account, I will see them marked on the map. I also share these lists with Jim so he sees them on his Google Maps. Here is the official Help for Google Maps Lists of Places. There’s lots more to Google Maps! Learn more tips and tricks with Google Maps by watching Episode 113 of What Does This Button Do. Our beginner’s lesson for that episode was Google Maps – Tips and Tricks.